was born on October 8, 1945. He was musically influenced by his parents (father: Leopold Katt, Musisches Heim, Mauterndorf). He studied composition with Prof. Alfred Uhl at the Vienna University of Music (diploma in 1972), worked as an organist in the monastery Stift Heiligenkreuz and as a music teacher in the “Bundesinstitut für Heimerziehung” in Baden. 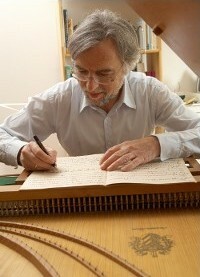 Since 1989 he has been working mainly as a composer. 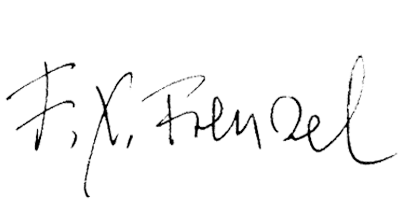 The creation of the pseudonym and Baroque personality Franz Xaver Frenzel allowed Katt to break away from academic constraints and to develop his music beyond the influence of stylistic conditions. His oeuvre comprises numerous works for orchestra and chamber music in various instrumentation, opera, musicals and film music, on CD and LP. * Leopold Katt (1917 – 1965), choirmaster, composer of numerous choirs, songs and canon’s: “Love Is a Ring” / “Many Arts” / “The Man Who Is the Head” / “A Hedgehog Sitting on a Stone ” / ” Canon–fair ” / “Arirang“ – folk songs from around the world / ” Amusing Herbarium “. . . and many more.